I've never truly appreciated the chat feature at Facebook until recently when my younger sister, Isabella's mom, buzzed me for a chat at 3am. I wasn't sure what time it was over in Bristol, but I was glad to be up working late that night. Otherwise I would have missed out on all the cute stories of my baby niece! Here to vote for you dearie!!! Oohhhh Isabella is looking soo cute and chubby.. I like them too like that GP!! lolzz... so cute and huggable...I love it!!! and a little tantrum thrower eh.. i wonder who's character is that... lolzz!!! Yeah.. the pic a bit blur .. but just the way I like pictures to be...lolzz!!! wink² heheh... eh I jut entered as well for my LJL but not takers yet..
Ha ha ha how could I forget? LJ loves blurry pics! heheheh... wah you done with today ep eh.. mine still dl lahh.... ok enjoy!! and I'll let you know when there's takers ok.. thanks dearie!!! RDH did lose that first comment of yours, but I'm here for a quick vote vote vote before our first Father's Day dinner of the weekend... Good luck! And thanks for the vote! She is definitely a cutie! you must be a very proud auntie Mariuca !!! Zoomed in on a rocket to say a quick hello after dinner and before I tuck the girls in...great day in Bay Head today, hope you had a good one, too. Sure does explain why you're the world's most popular blogger. P.S. -- Speaking of world's most popular blogger, did I ask you yet to vote for me to win the Blogger's Choice Hottest Mommy Blogger award? There's a widget just under the EntreCard in my RDH sidebar. With 4 votes so far, I'm only 270 behind Dooce...and she doesn't have blogosphere buddies like you and LJ! alamak!! baby isabella is so chubby! she's got a pretty look too!! marzie, pls stop me!! i think im gonna pinch her cheek lar!! lolz!! she's such a joy! Since I am now in Maine I will use a term that they use when a baby is outstandingly adorable. They always say "oh she's cunning"!! At first I thought how odd to say a baby is cunning. But, think about it...I had too..DUH..of course. A fox is cunning and in America when a guy sees a girl that he thinks is really hot or pretty he calls her a fox....visa verse when a girl thinks a guy is hot. I still like to say Wow....she's adorable. Oh and she is so very very adorable....I love chubby little ones too!! And you got your top EC box fixed so pretty!!! I haven't had anytime at all for anything!! That's another reason I dropped in. I am having a terrible time getting my Ec drops done tonight. It is taking forever for the pages to load. So I am headed to bed early and will try super duper early in the morning!! AWWWW soooo cute! Isabella is a beautiful name. I also try to get things from my parents by little tantrums, but this doesn't happen so often because they're tough and won't give in. But...I try my best, sometimes I win YAY! Howdy! I've "heard' conversations I believe between you and LJ about "favicon"? I believe it's that little icon before your URL in the address bar, I've always wondered how you put it there. I see your have yours up, and it's looking gooood! I didn't make my 300 drops for MPG yesterday, only managed up to 250+ since my connection was really slow last night! Ha ha ha!!! Jean!! Oh u gotta stop me too! When I see her next, I'm so gonna pinch her cheeks he he!! Yay, thank you Janice! When are u gonna have a baby girl la? He he! Hola Bobby! Ha ha ha, yay I do love the sound of snow baby and Isabella...they just go so well together he he! Yeah la, one of my friends baby also turned out to be a slim baby! 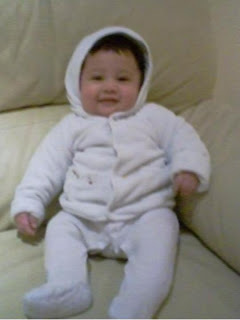 Masa kecik, really chubby then as he got older he lost all the baby fat too. I hope Belle will keep hers on until I see her next he he! Ooooh I bet Grandma would be interested in these cakes. Perhaps she might get some decorating ideas as well! GP!! Still not on your top 10 EC dropper list.. aiyoo.. I don't think I would ever be on it at this stage lahh... eh make it top 25 lahh...lolzz!!!! I'm sure I'll be on that one??!!! Eh not Mariuca, something else. How can Mariuca be on her own list!! He he!! GP!! How can that be?? I'm at your site everyday which means I drop everyday.. must be that one week I was in SG lahh!!! Aiyoo... how bout top 50??!!! lolzz!! Aiks.. how can you drop your own cards?? lolzz!!! LJ!! You know what? I'm such a silly billy! I think that stats was for MPG la ha ha ha! No wonder Mariuca is on da list! Okay, I'll check for Mariuca now, slow la internet! Also, just now I tried checking for 100, but the list only went to 25 max, why ah? haha.. that makes sense!! Tulah.. that SG trip really put me back by hoons!! Anyway.. takper lah.. I try harder.. but can only drop once a day lahh.. and if everyone drop as well... I aint got any chance..lolzz!!! I guess I have to make sure I stay your top commenter lahh.. that one I CAN control..lolzz!! Hi Mariuca, I think you realy deserve this award, please collect it from my blog when you're free..
Aww....little Isabella has grown chubbier than ever. Macam nak picit-picit pipi! Soooo cute. Ooooo.... she's so chubby and cute!!!! I voted for you at BE. orang putih kelong ah? tiap kali saya lugi! Oh my! I love her smile! And look at that pinky cheeks! A beautiful baby Isabella is! Aiyo ECL!!! You're so cute la he he!! Next time you join BOTB, you buzz me and let me know. If I'm up and about, for sure I'll come and vote for u, won't rugi so much mah he he! Thanks for your vote for Hottest Mommy Blogger, I voted for you for Best Blog of All Time when I first signed up, so I was one of your first 3 votes! Hope you had a great weekend. Mine was a lazy one, lol! How cute is she. That suit is gorgeous! Hey cud job i popped by me last on the top commenter list. cant be dropping off now can i! And I wonder where she got her midnight owl genes from? LOL! Back home in the Roxiticus Valley tonight, dropping a few EC from my bed...I can't believe LJ doesn't make your top EC droppers...with my Internet problems, I will never make ANYONE's top drop list! (but glad to hear I actually made it to number 16 for you!) I am not putting that widget in my sidebar until I make someone's top list! Hello, I came here when I was dropping an Entrecard and saw your card was the advertiser, so I clicked through. That baby is so adorable! You have a terrific blog, I will definitely be back! Ha ha, u already voted for me? He he he....just three votes so far then, thanks dear! Hola GK! Feel free to pinch all u want he he! I too can't resist, if only Isabella were here right now! He he thank you Aunty Tina! Isabella loves her snow baby outfit too! Oh my LLP rounds dearie!! ECL, that time I was very young only la he he! Thanks for your lovely comments on Web Directory. Really appreciate it very much especially when it come from the great Mariuca. I'm dropping off my EC too. As you can see on your dashboard, all three of my blogs are dropping their ECs on yours. GP!! I dont think I can make my 300 yet.. from just now until now.. my pages asyik hang from the slow connection.. macam choke you know.. ish ish ish... instead of saying.. boleh mati macam ni.. me and azwaj are saying.. boleh kaya macam ni.. so we are both now billionaire..lolzz!! A quick hello on Monday morning. Lots of work to do today and EntreCard doesn't seem to be working well for me so I can't drop here yet...if you're out and about in the blogosphere tonight and have a chance to vote for me, I'm in a new triple digit Battle of the Blogs! when is Belle coming back to Malaysia? I bet her aunty Marzie misses her like crazy. Thanks for returning my visit and for all the drops! I'll be dropping back for sure, so wait for me! Wah GP! Done already??!! Wei.. you pakai connection apa ni?? how come mine is so slow!!!... you nyer streamyx berapa mbps ni??? lolzz..Me still trying to drop my LLP card.. now baru sampai "Alright!" lolz!! You hurt your fingers?? how did that happened?? oohh B main kasar eh?? lolzz!!! Dear Marzie, wishing you the best of all your good mornings! LJ! I myself am not sure what my mbps is, how to check ah? ;) All I know is that I pay 99 per month. Haha! Ya lah GP. We all also cannot tahan seeing babies like this u know? Haha! Wow she's so sweet and adorable! i want more baby Isb pictures. That's one cute adorable and very huggable little one, I must say. Isabella is really cute and beautiful, really can be a model or celebrity some day! Hi Mariuca..."dropping" by on Tuesday at noon to invite you to vote for me in another triple-digit Battle of the Blogs...this time against Stik and his cows...I can't believe you don't have the guts for it, with your most excellent blog you should always win! Zubli falling behind on commenting in June...Roxy works hard to move ahead to #2 Mariucan! Am here with the kitties.. Meoww!!! Nihal!!!! Alamak, don't la make me blush he he! Great to see u here today Nihal. Hope everythig is okay on ur end as well. Hard work indeed.. I am only at "wicked" now with CT!..lolzz!! I don't think I sanggup do this every night esp if got post to write and speed yg gila2..lolzz!! End July would make Mama's niece a Leo baby yes? I'm a Virgo! :) How about u Sushi? 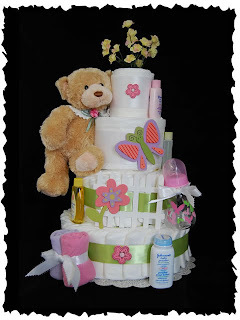 My, that diaper cake looks awesome. Great idea for baby gifts kan. Came here to say hi to Isabella. Hi Isabella, do you know that you are so adorable? Woww.. isn't Isabella such a dreammm!! I lovee love love babies being all chubby with cheeks like apples! LOL! My mom keeps asking me to fatten up my baby but there's nothing much I can do if she doesn't want to feed a lot. hahaha..
Ha ha chubby cheeks like apples? That's a great way to put it Shemah ha ha!! I hope Issy will remain chubby for a while, so nice to hug chubby babies kan? that is one beautiful gift hamper.